It seems to me that if you have a love for bicycles, you have a love for food, and vice versa. Or maybe that’s just my dream world. But I am not the only one that thinks they go together. Enter Dinner and Bikes, an annual tour to inspire the bike movement (and maybe as a byproduct, eating well). It’s a combination of bicycle inspiration, vegan food and pop-up bookstores; what’s more to want? 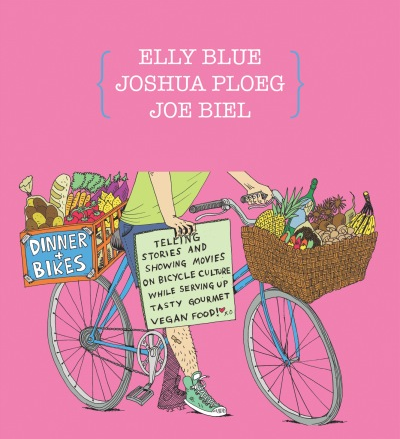 The tour is the brainchild of Elly Blue, who happens to be the publisher behind my own Culinary Cyclist project. I caught up with her to learn a little bit more about the tour that’s this year taking place in the Northeast (if you’re in the area, get the full schedule here). What was the inspiration for Dinner and Bikes? In 2010, Joe and I did a tour called Bikestravaganza around the western US. It was similar to what we do now, but just the two of us talking and showing movies about bikes. The idea was to energize people about bikes, show them a little of what we’ve seen is possible, and also let them know that Portland’s bike-friendly streets weren’t this huge, unattainable goal, but that in fact our achievements could easily be matched or surpassed by any city or town that wanted to. It went great, but one big problem was that the event was always during dinner time. Everyone was hungry including us! We invited Joshua to join us the next year and it all fell into place. When I first started bicycling, it was liberating and it’s continued to be so at a personal level. Culturally, though, it’s about as good as it gets as far as a movement goes. With bikes, everyone wins and there’s on problematic temptation to put someone else’s happiness or livelihood secondary to your cause, as is the case in a lot of other social movements. Also, even when people are vehemently anti-bike, they usually change their mind once they start riding. So even when it’s polarized, it isn’t really. That photo of Senator Schumer smiling as he rides down the cycle track he fought so hard to prevent? That’s why I do it. Why do you think bikes and food go together? Bikes and food are two areas where you can create a good life for yourself to the benefit rather than at the expense of others. There’s so much cognitive dissonance—I experience it every time I stop to think about the laptop I’m using to do all this work, where it comes from, who made it, etc. Neither the bike nor the food movement is perfect—which is to say that neither allows any individual to be separate from or rise above exploitative systems—but they both offer a path forward and out, if we choose it.